Luis Gonzalez c/o Arizona Diamondbacks - signed my four cards in black Sharpie in about 10 days, including my 2006 Topps Allen and Ginter and my 2008 Topps Allen and Ginter set cards. My lone redemption pack of 2010 Bowman black border cards came in the mail after I'd finally sent my 18 Bowman Chrome wrappers in the mail about three weeks ago - I think the cards would have 'popped out' more if they'd been the Chrome variety instead of basic Bowman prospect cards slapped with a black border. Looking on eBay, the basic black border cards are worth about as much as their regular Bowman Prospect counterparts - of course the real money in these redemption packs is when someone pulls the Bryce Harper 'buyback' 2010 Bowman Chrome USA card. Duke Snider's passing on Sunday may mean more to old-school baseball fans and in particular, those who grew up with the Brooklyn Dodgers - however he was a Hall of Fame legend who seemed to enjoy a reputation for being a gracious signer in-person or through the mail. With regards to autographs, this story captures just about everything I know and perhaps want to say about Snider and signing autographs - perhaps good and bad. As far as I was concerned, I never met him in-person and Snider used to refused or 'RTS' mail sent to his listed address - when I started to write him in the early 2000s. In my experience, I remember having to mark the envelope, 'donation enclosed' to get any sort of positive response - things got better however and for a period of time the successes from Snider in the middle of the 2000s came flooding in. Most seem to enclose any small fee sent to him, though other times I've read he signed TTM with no donation enclosed - one of the cards I was able to get signed TTM is shown in appreciation of the several times I was able to get something back from him during the past 10 years. May Mr. Snider rest in peace. Another picture of the list of cards - I'll now know I'll have delivered to me through the Topps Million Card Giveaway, a day or so before the promotion ends. I figure that at the very least I'll be able to say I was one of the collectors who took part in having cards delivered from this promotion - instead of just blowing it off and choosing not be part of the collective. I think the best part of the promotion was being able to trade the virtual cards before having the option to have them delivered - I didn't have anything special and I didn't get any substantial offers, but I was always checking every day to see if someone had offered me a really valuable old-timey Topps card for my drecks. Maybe I should have kept my 1950s cards, though I'll still have one 1961 Topps common to show for my Million Card endeavors - from the original 'list' of cards I thought about having delivered, I think I already had a 1969 Topps Larry Dierker [found in a dollar scrap bin and eventually autographed TTM] and I was able to trade that for a 1972 Topps Burt Hooton multiplayer rookie card. 2011 Topps 72-card Walmart box [$9.98 each] - I wanted to these even though it is your basic 2011 Topps with packaging that looks a little different; I guess this really replaces the $9.99 blasters from four or five years ago and the cereal boxes from the last couple of years. Was 0-for-6 in my attempt to find Sparkle variations - I've decided to break all sorts of 2011 Topps packs/blasters/etc until I actually pull one. #69 Brett Gardner - any card of a player with 'game used' dirt on his uniform is a keeper. #274 Michael Brantley - could care less about the player but I like the image of Brantley diving back to the bag. #303 Emilio Bonifacio - making a headfirst slide into third base. #21 Michael Cuddyer - I like how Cuddyer is caught in the air as he looks to get the ball back into the infield. #185 Peter Bourjos - making a highlight reel catch in the outfield. #TDG-5 Derek Jeter Diamond Giveaway code card - redeemed for a 1977 Topps common of Glenn Abbott and a dig that resulted in a Houston Astros ring. More spring training requests sent out on 2/24/11 - each request was mailed in a business envelope using at least one Forever stamp and $0.17 in additional postage [around $0.61]; a typed letter and a SASE with one Forever stamp was sent with each request. Dustin Ackley - sent two 2009 Tristar Prospects Plus multiplayer subset cards #93 and #97. Francisco Cervelli - sent a 2010 Topps Update. Eric Chavez - sent a 2002 Upper Deck Diamond Collection and a 2004 Donruss Throwback Threads. Michael Cuddyer - sent a 2010 Topps Allen and Ginter. Felix Doubront - sent a 2010 Bowman Draft. John Danks - sent a 2007 Bowman Draft. Chone Figgins - sent a 2006 Topps and a 2009 Upper Deck O-Pee-Chee. Freddie Freeman - sent a 2011 Topps. Jason Giambi - sent a 2004 Upper Deck USA 25th Anniversary and a 2010 Topps Update. Yasmani Grandal - sent a 2010 Bowman Draft. Brad Hawpe - sent a 2008 Bowman and a 2009 Topps. Bobby Jenks - sent a 2005 Bowman Draft and a 2006 Topps Allen and Ginter. Andruw Jones - sent a 2001 Fleer Focus and a 2002 Upper Deck. Tom Kelly - sent two 2001 Topps. Carney Lansford - sent a 1981 Donruss and a 1991 Donruss. Jesus Montero - sent a 2008 Donruss Threads. Carlos Pena - sent a 2002 Upper Deck and a 2008 Upper Deck Goudey. Rob Rasmussen - sent a 2010 Donruss Elite Extra Edition. Tony Sanchez - sent a 2009 Donruss Elite Extra Edition School Colors insert. Ryne Sandberg - sent a 1990 Score Dream Team subset and a 2008 Donruss Threads. Max Scherzer - sent a 2008 Topps Stadium Club. Seth Smith - sent a 2009 Topps Update and Highlights and a 2009 Upper Deck. Jake Westbrook - sent a 2000 Bowman and a 2005 Topps Turkey Red. Warren Moon c/o business address - the former professional football player signed my four cards in black Sharpie and returned one card unsigned. This request took about two weeks - also enclosed a card [looks like a bookmark] promoting Moon's Twitter, Facebook and official Web site. Before going to work last Saturday, I stopped at a card shop and looked through the quarter bins - I was looking through the most recent 5,000 card boxes within reach, particularly the row with 2011 Topps. I picked up the following cards for $3 and change [tax] - I went mostly for cards of younger players instead of interesting cards I can add to my collecting topics collections. 2011 Topps Rick Ankiel #34 - the image is just great as Ankiel tries to slide headfirst into third base without getting tagged by the third baseman. I could just imagine the Atlanta Braves' third base coach barking at Ankiel to get down. This maybe my most favorite 2011 Topps card. 2011 Topps Pedro Alvarez #95 - I believe this is his first Major League card after some USA, Razor and minor league cards issued over the last five years. 2011 Topps Jay Bruce #191 - probably my second most favorite card out of 2011 Topps; looks like Topps got this notable image from Getty too. Got around 52 different Angels cards in the mail yesterday - I remember sending an e-mail with my address to a blog called Section 36, giving away cards. The Angels were one of the teams that weren't claimed and I jumped at the opportunity to add to my collection. I don't know about any other sane collectors - but I always like to flip through a stack of any cards I haven't gone through before, perhaps in anticipation perhaps of finding at least a couple of interesting cards. The Angels cards I received were from 2001 and it feels just a little weird 10 years has already past - there were about 10 Darin Erstad cards in the stack of Angels and I'd post some of the cards I received. Despite his stats screaming 'complimentary player,' with only one 'great, superstar' season in 2000 - Erstad is held in high regard among Angels fans because he played the game hard and unforgiving. Erstad was the definition of what Bill James once said about Don Mattingly - 100 percent ballplayer, 0 percent BS. Thanks Section 36 for the cards. I finally got to a post office and mailed off an initial 'set' of spring training requests for 2011 - each request was mailed in a business envelope with at least a Forever stamp and $0.17 in additional postage [around $0.61 per letter sent]. Inside the outgoing envelopes, there is a typed letter and SASE with one Forever stamp enclosed - along with a random card or two sent to be autographed at some point. Brandon Belt c/o San Francisco Giants - sent a 2010 Topps Pro Debut. Lance Berkman c/o St. Louis Cardinals - sent a 2004 Fleer Platinum and 2010 Topps Update. Chad Billingsley c/o Los Angeles Dodgers - sent a 2008 Topps and 2008 Upper Deck Goudey. Zack Cox c/o St. Louis Cardinals - sent a 2010 Bowman Draft. Kyle Drabek c/o Toronto Blue Jays - sent a 2006 Bowman Draft Chrome and 2011 Topps. Adrian Gonzalez c/o Boston Red Sox - sent a 2009 Upper Deck Legendary Cuts and 2009 Topps Update. Josh Hamilton c/o Texas Rangers - sent a 2010 Topps Update All-Star card. Bryce Harper c/o Washington Nationals - sent a 2010 Topps Washington Nationals team card. Jeremy Hellickson c/o Tampa Bay Rays - sent a 2010 Topps Pro Debut. Adam Jones c/o Baltimore Orioles - sent a 2007 Topps and 2009 Topps T206. Hong-Chih Kuo c/o Los Angeles Dodgers - sent a 2008 Upper Deck and 2010 Topps Update. A.J. Pierzynski c/o Chicago White Sox - sent a 2007 Topps Allen and Ginter. Mariano Rivera c/o New York Yankees - sent a 1998 Donruss Elite and 2005 Fleer Ultra. C.C. Sabathia c/o New York Yankees - sent a 2009 Upper Deck. Jerry Sands c/o Los Angeles Dodgers - sent a 2010 Topps Pro Debut. Joey Votto c/o Cincinnati Reds - sent a 2011 Topps #134. Chien-Ming Wang c/o Washington Nationals - sent a 2007 Bowman Heritage and 2010 Topps. Brandon Webb c/o Texas Rangers - sent a 2007 Topps A&G and 2009 OPC. I realize I might not get any responses from these players at all and any response may come next off-season or sometime next year - I think I still have to send the requests out in case someone responds. However, getting them all back in a timely manner with successful responses [meaning either my card was signed otherwise] may not be realistic. Maybe there is a reason this is at the bottom, but former MLB pitcher Kevin Gross returned my cards unsigned c/o a home address - I assume my request got to either Gross or a family member; perhaps he just wasn't home to answer any requests, though there could be several other reasons why I couldn't get my cards inked up. Whoever sent my cards back used my SASE and took about a month to do so - kind of a bummer since I spend all sorts of odd hours putting together these requests. The requests are unsolicited, but I assume it just comes with the territory, that a former ballplayer is going to receive autograph requests in the mail. After reading this, I unlocked my first code card on the new 2011 Topps Diamond Giveaway Web site - for a 1967 Topps John Buzzhardt. Bill Buckner c/o home - signed two cards in blue ink and one of the penny sleeves used to hold the cards I sent him. Despite my worry about sending $10 to Buckner in order to sign my cards, this autograph request was otherwise successful - particularly when I had to get my penny sleeve signed for my set. Right now, I think I'm looking to put together autograph requests I'm sending out to spring training sites - I'm hoping to get an initial 20 out this week and maybe an additional 20-30 the following week, just so the requests are 'out there' with a chance I might actually get something in the mail box. At the 2010 Futures Game in Anaheim - she scrawled out her autograph quickly on one of those white, thick filler decoy cards. I saw her again signing along the railing before the Futures Game and got her to sign a random International League baseball that I got during BP at an Angels game. Recently I was leafing through Athlon Sports Baseball 2011, one of the baseball fantasy/preview/guides - there was a blurb about one-time independent league and current Boston Red Sox outfielder Daniel Nava always leaving tickets for Andrews in the minor leagues. It isn't a new story, just adds to Nava's feel-good rookie year in 2010 - I'm not going to say it is disturbing at all, Andrews has been all over the place [good and bad] in the last couple of years and she's a fantastic gal to look at. The blurb was pretty straightforward, but image used in the magazine blurb just struck a certain cord - I may have no life, but I was compelled to pick up the magazine for $8 and clip the blurb out with Andrews all glammed up and wearing an outfit highlighting her best assets. Instead I saved my $8 and found full-size images online, making me very happy - I cropped one of the images I thought was probably the most similar to the one I saw in the magazine. Gary Payton c/o home address - I received one signed card in black Sharpie in about seven days, though my other card was kept. I don't usually send non-baseball autograph requests anymore - but as the most casual NBA fan over the last 15-20 years, I sent a request to Payton when I saw the former NBA star was apparently signing stuff sent to him. I assume the autograph was actually signed by Payton - looking at the autograph up-close, there are just a couple of imperfections. 2010 Bowman Draft Value Pack [$4.99 x1 at a Walmart] - I really wanted to get a 2011 Topps blaster box, but went to Walmart first and got a Value Pack of 2010 Bowman Draft. There were 2011 Topps blasters at Walmart for $19.98, but I prefer the Target Throwback variations - since the Walmart cards are mostly 'blacked out' except for the image, which makes any particular card worthless to be autographed in-person / through the mail. There was a 72-card box of 2011 Topps for around $10 - which I was tempted to get since I hadn't seen the packaging [it kind of resembles a box used for gaming cards and it isn't the 'cereal boxes' used in previous years] used in baseball before. It maybe just random, but the two Targets I went to didn't have any 2011 Topps blaster boxes - all I found at the Target closest to my home was a pack molester doing the deed with some Upper Deck hockey packs; guy was focused on getting to second base with multiple packs and was otherwise oblivious by my presence. I was actually more uncomfortable seeing what he was doing than he was in seeing me. There was a Toys R'Us next door to the Target which had Jumbo Packs and blaster boxes of 2011 Topps - but I don't think the Toys R'Us blasters have either the Walmart black variation or the Target Throwback variation. Also for some reason, their rack packs are priced a dollar higher at $5.99 and their blaster boxes are actually priced at $23.99. My one Value Pack of 2010 Bowman Draft - I picked up a complete set, but perhaps having extra cards from some of the players from this set will give me an opportunity to get those players on multiple cards. #BDPP 92 Chris Sale Chrome - though a lefty, he's been compared to Tim Lincecum because he is a rather smallish guy with a rocket for an arm. 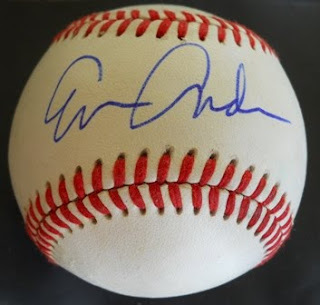 #BPA-GH Graham Hicks autograph - he's a minor leaguer who was traded to the Chicago Cubs from the Washington Nationals with Michael Burgess and A.J. Morris in exchange for Tom Gorzelanny. Dustin Hermanson c/o home - he signed my three cards in blue Sharpie in about a month, including a 2004 Upper Deck Team USA 25th Anniversary card for my set. Originally the No. 3 overall pick by the San Diego Padres in the 1994 Amateur Draft - Hermanson was an OK starting pitcher for the Montreal Expos and St. Louis Cardinals from the late 1990s through early 2000s before it looks like injuries derailed his ability to be a full-time starter. However, in his final full season in the Major Leagues - Hermanson did record a 34 save season for the 2005 World Champion Chicago White Sox. Collecting topics cards are usually common cards with unique characteristics - I collect at least 10-15 of them, including ones that seem to be 'popular' with other like minded bloggers; facial hair, play at the plate, pitchers hitting, etc. My favorite one or the one that got me started in this whole mess were cards featuring 'bonus babies,' like I read in a 1997 Beckett Magazine story - where notable players would be making 'cameos' on otherwise common players' cards. It is fun to look for bonus babies/cameos/collecting topics cards because there is no set checklist, no real guide - when digging through a bunch of commons cards, it is fun to think of all the themes/collecting topics in my head and seeing if I can add one, two or more cards to the mix. Jon Garland c/o Chicago White Sox - signed a 2007 Topps Heritage card in blue Sharpie and returned the 2006 Topps Allen and Ginter unsigned; like the Reed success, this was mailed back in 2007; received back on 2/11/11. By coincidence, I had a card of Garland in my little box of cards I'm going to try to mail out - also looking for any non-spring training baseball in-person autograph action, I was just checking out a YouTube video of Garland signing at the San Diego Padres' Fan Fest in 2010. Adam LaRoche c/o home address - signed one card in black Sharpie, returned the 2006 Topps unsigned and kept the 2006 Bowman Heritage. LaRoche is an OK player who might be considered below average when looking closer at the numbers - he has the ability to hit for power though doesn't walk enough to justify striking out a lot. Nothing else really stands out except he is part of a baseball family - brother Andy was once a top prospect with the Los Angeles Dodgers, but has bounced around a little bit and is now in the Oakland A's organization while their father Dave was a serviceable Major League pitcher. Jody Reed c/o Gulf Coast Yankees - signed my four cards in blue Sharpie. This autograph request took about three years or so and showed up in my mailbox with a $0.41 stamp on 2/10/11 - I knew I'd sent to Reed at some point long ago, though the actual record of what was sent, where and when was probably scratched out on some loose piece of paper long discarded. I actually found the Word document with my letter to Reed however - the letter was dated July 11, 2007, so I assume that is around the time when I sent the letter. Reed was a second baseman with the Boston Red Sox who came up in 1987 and spent five full seasons in Boston - before bouncing around with several other teams for the rest of his 11 year Major League career. For this upcoming season, he was named the manager of the Los Angeles Dodgers' Arizona League team - the postmark on my SASE was from Denver, Colorado and apparently that is where Reed and his family currently lives. I picked these 2010 Bowman Sterling cards up for about $4 each plus s/h on eBay - Tago was the No. 47 overall pick in 2010 by the Colorado Rockies and Brown was the No. 24 overall pick by the San Francisco Giants. Tago doesn't have the best autograph, though perhaps being a teenager just out of high school can explain that just a little bit - while Brown, drafted as a college player from Cal State Fullerton has a little better looking autograph. It is going to be interesting to see how these guys' pro careers will develop and where these guys are going to be playing in a couple of years - Tago supposedly has electric stuff and Brown is supposed to be a good leadoff prospect who perhaps is comparable to Eric Byrnes perhaps, though with less pop. I picked up three $4.99 jumbo packs of 2011 Topps at Target - flagship Topps is always refreshing to rip when they first come out. I like the white bordered base cards on this Topps' fare for the masses and it seems like the images on this year's cards really sharp - the images are bright and clear, instead of being dull, uninspiring and gloppy. I was keeping my eyes peeled for any Diamond Sparkle variation, thinking I was going to find at least one out of my racks - but these short print parallels maybe harder to find than I had hoped. I think like everyone else, the Platinum Diamond variations are pretty sweet looking - collecting them all is not realistic, but they are 'prettier' and much easier to pull than the cards with a doctored sparkle on them. I normally wouldn't care about the 2010 NL Wins Leaders card [#11] I pulled, but the Platinum Diamond treatment makes enhances the card's aesthetics. I pulled an Kimball Champions Albert Pujols insert, which was nice - but these mini cards look sort of homemade. I pulled other inserts, which I didn't really find all that interesting I guess - all I know is I probably don't need a reprint of a 2004 Topps Mark Teixeira [#60YOT-53] or a reprint of a 1999 Topps card of Mike Piazza, Ivan Rodriguez and Jason Kendall [#60YOT-48]. 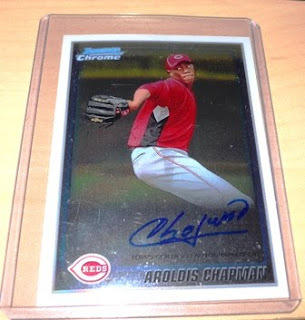 I got a replacement for a 2010 Bowman Chrome autograph of Aroldis Chapman - it sort of ends the initial saga that started when I impulsively bought a box of 2010 Bowman Chrome for $39.99 shipped, when I clicked the a link to the eBay auction on Atlanta Sports Cards on Black Friday. After sending payment and eventually getting my box, I ended up pulling the Cuban Missile's autograph - unfortunately everything stopped when I realized the autograph on the card wasn't just streaked, but it looked like the autograph had just beaded up. I ended up sending the card back [along with a base cards of Vladimir Guerrero and Cesar Valdez that suffered some surface damage] to Topps late in December - I was worried about getting a positive response because I was told [through a trading card forum I frequent] to send the cards and a letter in without all the rigmarole Topps has apparently had collectors go through in recent years. There is also a Bowman Chrome wrapper redemption program going on - so I couldn't send in the wrappers I had in-hand in case Topps had needed it as proof of purchase or whatever. Perhaps my letter explaining my situation and the cards I sent in would go into someone's circular file - maybe I'd get an explanation it was too late to send the damaged card in or there was no more replacement Chapman Bowman Chrome autographs. I dreaded the idea I'd get an Anthony Bass or a Ehire Adrianza autograph for my impulse box purchase. I took a trip to the post office last Saturday and had to sign for my certified mail package at least three times [including writing out my name and address at least once] - I opened the mailer sent to me and inside was my replacement cards in individual top loaders, but not in penny sleeves. There was no letter or anything else, just my cards. I want to say I don't know if the replacement Chapman card was in better condition that the one I originally pulled - however, the autograph on the card was definitely cleaner, so that is what counts for me. Perhaps consider these as a 'preview' of things I'm probably going to blog about, but when I finally got hold of a loose $10 I deemed I could spend - I finally decided to fire off an autograph request to Bill Buckner c/o his home address, hoping he will sign the 1970 Topps rookie card and a 1984 Fleer I enclosed. Usually when someone requests a fee to sign something through the mail, though not really as part of a bigger, organized signing - perhaps there is a risk even though I assume some care will be taken as far as the cards being autographed and returned safely in the self-addressed stamped envelope I enclosed. I was looking forward to perhaps meandering to my local retail Target store to pick off a couple of $4.99 Value Packs / rack of 2011 Topps - though I'm trying to not be a lemming, especially when I know I'll end up busting some 2011 Topps one way or the other. Besides, the novelty of new base Topps wears off [for me] pretty quickly - when these cards will be everywhere.